The uber popular streaming video site has unveiled its new paid subscription service and future plans. The YouTube Space in L.A. played host to a number of announcement about the website and its mobile app, and now there have been announcements with regards to two interesting new features that will be added to the streaming service’s Android application. The announcement stated that virtual reality video would be added to the YouTube Android app. This provides V.R. with the largest platform that it has ever had. The mobile app already supports virtual reality video, which is a format that provides viewers with 360 degree perspectives of the videos which the company has said makes the experience more realistic. In order to view one of these videos, a user must simply play the virtual reality video on the application, then select the VR mode button. The phone must then be placed in the “Cardboard” device from Alphabet Inc. That gadget is what provides the actual viewing experience in virtual reality. The Cardboard viewer can be used to upload virtual reality content to be viewed through the YouTube mobile app. According to YouTube, at the time of the launch of the service, there were about a dozen videos available in this format, including one that was based on content from the Hunger Games movies. YouTube has also announced that a more limited virtual reality experience would be available using Cardboard simply by playing the rest of the videos in the streaming site’s massive library. Those videos would give the type of experience that would be expected from an IMAX theater. 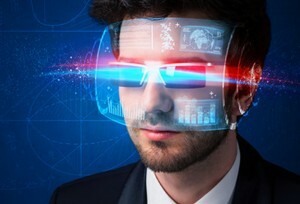 According to the Immersive Technology Alliance executive director, Neil Schneider, 3D video was first introduced by YouTube in 2009 and the company was an early HD video adopter. For that reason, the VR trade organization’s executive director said that “It’s not surprising they would take the angle of adding virtual reality”. Schneider also stated that people should be able to anticipate an influx of high quality content, but also said that it would likely be quite difficult to create amateur content since it is usually quite expensive to purchase the equipment needed to make VR content. It will be interesting to see how this changes the experience provided by the YouTube mobile app.